How to solve the derivation? How do I solve this derivation? 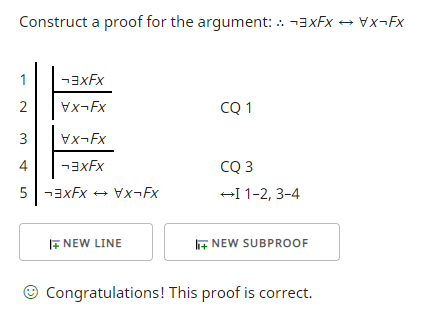 The following is a proof using Klement's proof checker and the rules described in forall x. You may need to use something different with the software you are using, but this may give you an idea how to proceed. "CQ" refers to the change of quantifiers rule. A derivation of the CQ rule is given in forall x (see link below) on pages 260-1. Each conditional is derived separately. The biconditional introduction (line 5) is permitted by these rules when I reference both of the conditionals on lines 1-2 and lines 3-4. Not the answer you're looking for? Browse other questions tagged logic proof symbolic-logic or ask your own question. Anyone can help me with proving ~(AvB) |- ~(BvA) via natural deduction? How to derive ( E v C ) using sentential derivations?